The 074 Series Two-Way Ball Valve design promotes multiple configurations to fit the exact end use application. The Inlet Seal is Sanoprene. The Outlet Seal is Teflon®. Gray PVC is the standard material, Black Filled Polypropylene and White Filled Polypropylene are available for chemical resistance applications. Gray PVC and White Polypropylene are NSF Standard 61 approved materials. The Lever Handle is available in Blue, Gray, Black or White. The 226 Series Two-Way Ball Valve design promotes multiple configurations to fit the exact end use application. Gray PVC is the standard material and is an NSF Standard 61 Approved Material. Nylon and Filled Polypropylene are available for chemical resistance applications. MakroBlend is an NSF Standard 51 Approved Material. The optional panel mount hole is .750 and comes with a Brass or Electroless Nickel Plated Hex or Knurled panel mount nut. The Flag Handle is standard, a round knurled handle is optional. The 250 Series Two-Way Ball Valve design promotes multiple configurations to fit the exact end use application. Gray PVC is the standard material and is an NSF Standard 61 Approved Material. Filled Polypropylene is available for chemical resistance applications. The Lever Handle is standard with an optional Mini-T Handle or Round Handle available. The 275 Series Two-Way Ball Valve design promotes multiple configurations to fit the exact end use application. Gray PVC is the standard material, Gray Filled Polypropylene is available for chemical resistance applications. The Lever Handle is standard with an optional T Handle available. The 326 Series Three-Way Ball Valve design promotes multiple configurations to fit the exact end use application. 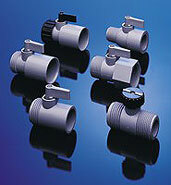 The bottom port is common and the 326 Series can be used as a diverter or selecting valve. The handle has 180° rotation and lies over the open port. When the handle is rotated 90° from either port, flow is shut off to both ports. Gray PVC is the standard material and is an NSF Standard 61 Approved Material. Nylon and Filled Polypropylene are available for chemical resistance applications. MakroBlend is an NSF Standard 51 Approved Material. The optional panel mount version requires a .750 hole and is supplied with a knurled brass panel mount nut. 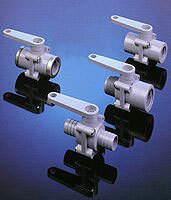 The 350 Series Three-Way Ball Valve design promotes multiple configurations to fit the exact end use application. 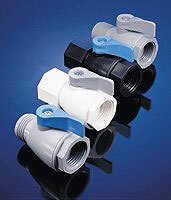 The bottom port is common and the 350 Series can be used as a diverter or selecting valve. The handle has 180° rotation and lies over the open port. When the handle is rotated 90° from either port, flow is shut off to both ports. Gray PVC is the standard material and is an NSF Standard 61 Approved Material. Filled Polypropylene is available for chemical resistance applications. The Lever Handle is standard with an optional Mini-T Handle or Round Handle available. The 351 Series Three-Way Ball Valve design promotes multiple configurations to fit the exact end use application. The bottom port is common and the 351 Series can be used as a diverter, selecting, or mixing valve. The handle has 90° rotation and lies at 45° towards the open port, while the other side port is shut off completely. When the handle is rotated 45° from either port, there is partial flow to both ports. There is no point in the handle rotation where flow is shut off to both ports at the same time. Gray PVC is the standard material and is an NSF Standard 61 Approved Material. Filled Polypropylene is available for chemical resistance applications. The Lever Handle is standard with an optional Mini-T Handle or Round Handle available. The 425 Series Two-Way Ball Valve design promotes multiple configurations to fit the exact end use application. Gray PVC is the standard material and is an NSF Standard 61 Approved Material. Filled Polypropylene is available for chemical resistance applications. The Lever Handle is standard with an optional Round Handle available. The 628 Series Two-Way Trunnion Ball Valve design promotes multiple configurations to fit the exact end use application. The T-Handle and Ball are one piece extending through the valve body and sealed on the top and bottom. The 629 Series Three-Way Trunnion Ball Valve design promotes multiple configurations to fit the exact end use application. 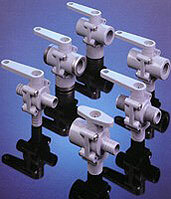 The bottom port is common and the 629 can be used as a diverter or selecting valve. The handle has 180° rotation and lies over the open port. When the handle is rotated 90° from either port, flow is shut off to both ports. The T-Handle and Ball are one piece extending through the valve body and sealed on the top and bottom. The 638 Series Two-Way Ball Valve design promotes multiple configurations to fit the exact end use application. The 638 Series Valve was originally designed for the water purification industry and is NSF Standard 58 approved. Filled Polypropylene is available for chemical resistance applications. The 657 Series Two-Way Ball Valve design promotes multiple configurations to fit the exact end use application. The 657 Series Valve was originally designed for the water purification industry and is NSF Standard 58 approved. Filled Polypropylene is available for chemical resistance applications. The 658 Series Rotary Valve design promotes multiple configurations to fit the exact end use application. The 658 Series Valve was originally designed for the water purification industry and is NSF Standard 58 approved. Filled Polypropylene is available for chemical resistance applications. The 689 Series T-Link Valve design promotes multiple configurations to fit the exact end use application. The 689 Series Valve was originally designed for the water purification industry as an RO or Ice Maker supply valve and is NSF Standard 58 approved. The QEST Ends sized as follows: 1/4 QEST (3/8 OD TUBE or Copper Pipe), 3/8 QEST (1/2 OD TUBE or Copper Pipe), 1/2 QEST (5/8 OD TUBE or Copper Pipe).